Over the summer, I usually have the opportunity to spend more time at home, making it easier to experiment with ingredients. Although I love concocting healthy recipes, one of the problems I encounter the most is incorporating vegetables. I constantly feel like I’m missing out on all of the vitamins and antioxidants they have to offer. After tons of reading about this super food, I realized I had to try a recipe with kale! In an effort to beat the heat this Summer I put together this Kale Smoothie Recipe. Don’t be afraid of its green color, it’s delicious! Blend the kale, spinach, green apples, and pineapple in your favorite blender, slowly adding water to help break down all of the ingredients. Add ice and/or honey to your liking and you’re done! On days where I feel like substituting coffee, I will also add a teaspoon of fresh ground ginger to give my kale smoothie a kick! I hope you enjoy the recipe, I know it has become one of my favorites! Do you have any go-to smoothie recipes? 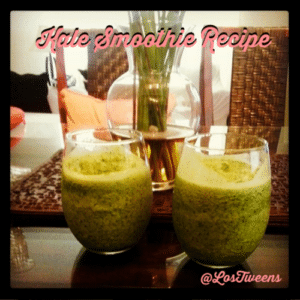 This entry was posted in Recipes and tagged Food, healthy, kale, kale smoothie, kale smoothie recipe, recipe, smoothie, summer, super food, vegetables, vegetarian, veggies. Bookmark the permalink.